Growth rate: Slow to rapid, depending on water and soil compactness. Mature Size: 3-5' high and wide. 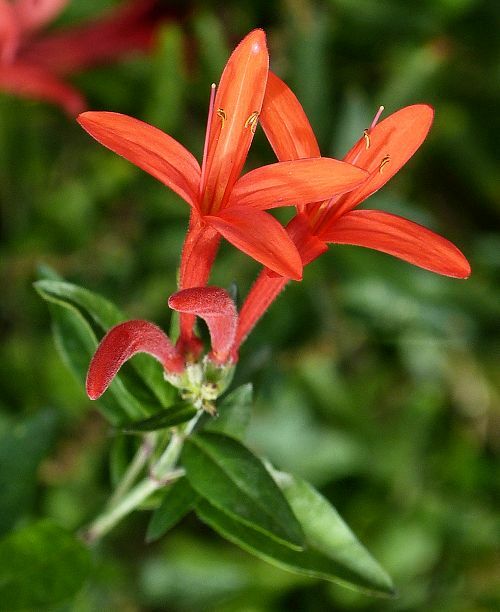 Flowers: Orange to red, tubular, up to 2" long, usually pointing upward, clustered on ends of main and lateral stems. Bloom: Mid spring, or summer, into fall with weekly irrigation. Once well established, it will bloom in October whether irrigated or not. Fruit: Brown capsules with black seeds. 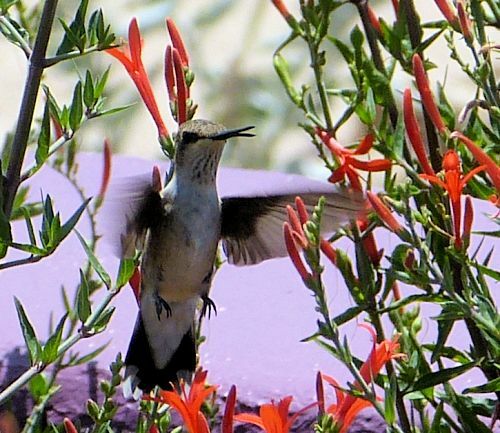 Wildlife: Attracts hummingbirds, large butterflies. Browsed by rabbits, deer and other mammals. A caterpillar food plant for Elada and Arizona Checkerspot butterflies. Sun: Full sun to light shade. More sun produces more blooms. Water once established: Monthly for survival. This plant will need water once or twice a week to flower and attract butterflies and hummingbirds during the growing season. Soil: Well drained, pH 6.1-7.8 (slightly acidic to slightly alkaline). Compacted soil slows growth. Prune: In late winter, shear to encourage new growth. It can be pruned into a hedge. Propagation: Seed or cuttings. It will reseed in favorable conditions. Uses: Ornamental, wildlife attractor, low hedge. This plant is a member of the Acanthus family (Acanthaceae). 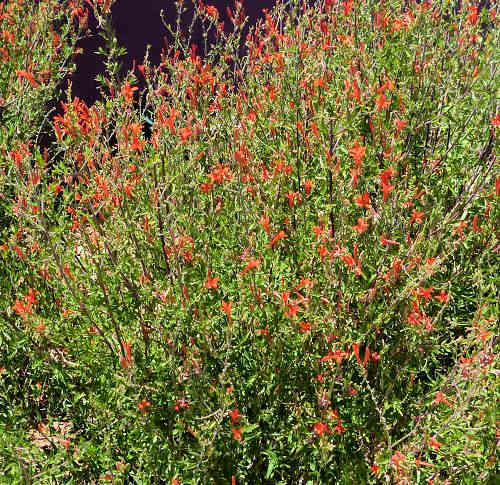 Other common names include Mexican Flame, Texas Firecracker, and Wright's Desert Honeysuckle. This shrub needs protection from browsing mammals. It is not a low-water plant if flowers are desired for more than one month. 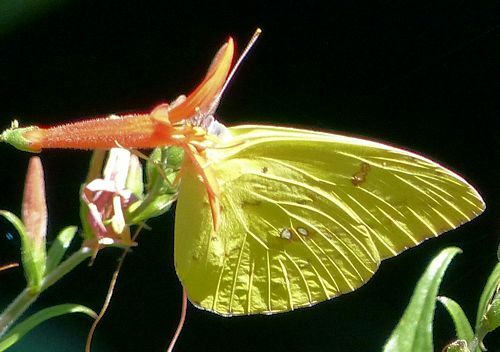 The butterfly in the photograph is a Cloudless Sulphur.